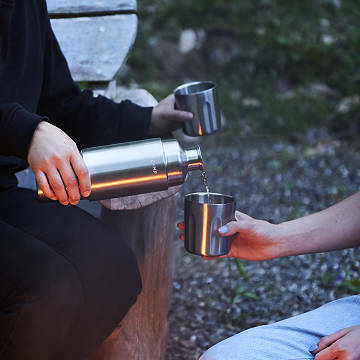 This traveling chrome beverage set lets you enjoy your favorite drinks wherever you go. You're sipping whiskey at the edge of a crackling campfire under a sky full of stars. You're spread out on the grass, enjoying the summer breeze and white wine with your picnic sandwiches. Wherever you go to get away from it all, there's a drink to go with it, and this bottle set is how to take it with you. The sleek, chrome body is insulated to keep your wine chilled and your whiskey neat, even at the beach or on the golf course. At the top and bottom of the bottle are two convenient tumblers, held securely in place with magnets during travel. It's the perfect grown-up companion to your grown-up adventures. Made in China. 11" H x 3.5" Dia. Has been a great way to bring your own drink choice to a party in case they do not have something you want. It also makes it easy to keep track of how much you are drinking if you stick to what is in the container. I love the magnetic screw on lid. Super handy when I'm washing it. It sticks to the sinks and stays there. Also fun to use it to pick things up with. The container itself is tough and takes a beating.